Location of New Brunswick in Middlesex County. Inset: Location of Middlesex County highlighted in the State of New Jersey. New Brunswick is a city in Middlesex County, New Jersey, United States. It is the county seat of Middlesex, and the home of Rutgers University. The city is located on the Northeast Corridor rail line, 27 miles (43 km) southwest of Manhattan, on the southern bank of the Raritan River. At the 2010 United States Census, the population of New Brunswick was 55,181, reflecting an increase of 6,608 (+13.6%) from the 48,573 counted in the 2000 Census, which had in turn increased by 6,862 (+16.5%) from the 41,711 counted in the 1990 Census. Due to the concentration of medical facilities in the area, including Robert Wood Johnson University Hospital and Saint Peter's University Hospital, as well as the University of Medicine and Dentistry of New Jersey (UMDNJ)-Robert Wood Johnson Medical School, New Brunswick is known as "the Healthcare City", The corporate offices or production facilities of several large pharmaceutical companies are within the city limits, including Johnson & Johnson and Bristol-Myers Squibb. New Brunswick was formed by Royal charter on December 30, 1730, within other townships in Middlesex County and Somerset County and was reformed by Royal charter with the same boundaries on February 12, 1763, at which time it was divided into north and south wards. New Brunswick was incorporated as a city by an Act of the New Jersey Legislature on September 1, 1784. New Brunswick is noted for its ethnic diversity. At one time, one quarter of the Hungarian population of New Jersey resided in the city and in the 1930s one out of three city residents were Hungarian. Today, much of that Hungarian community continues to thrive as well as a growing Hispanic community that has developed around French Street near Robert Wood Johnson University Hospital. Originally inhabited by the Lenape Native Americans, the first European settlement at the site of New Brunswick was made in 1681. The settlement here was first called Prigmore's Swamp (1681–97) then Inian's Ferry (1691–1714). In 1714, the village was given the name New Brunswick after the city of Braunschweig (called Brunswick in the Low German language), in state of Lower Saxony, in Germany. Braunschweig was an influential and powerful city in the Hanseatic League, later in the Holy Roman Empire, and was an administrative seat for the Duchy (and later Principality) of Hanover. Shortly after the first settlement of New Brunswick in colonial New Jersey, George, Duke of Brunswick-Lüneburg, and Elector of Hanover, of the House of Hanover (also known as the House of Brunswick), became King George I of Great Britain (1660–1727). Centrally located between New York City and Philadelphia, Pennsylvania along an early thoroughfare known as the King's Highway and situated along the Raritan River, New Brunswick became an important hub for Colonial travelers and traders. New Brunswick was incorporated as a town in 1736 and chartered as a city in 1784. It was occupied by the British in the winter of 1776-1777 during the Revolutionary War. The Declaration of Independence received one of its first public readings in New Brunswick in the days following its promulgation by the Continental Congress. The Trustees of Queen's College (now Rutgers University), founded in 1766, voted to locate the young college in New Brunswick, selecting this city over Hackensack, in Bergen County, New Jersey. Classes began in 1771 with one instructor, one sophomore, Matthew Leydt, and several freshmen at a tavern called "The Sign of the Red Lion" on the corner of Albany and Neilson Streets (now the grounds of the Johnson & Johnson corporate headquarters). 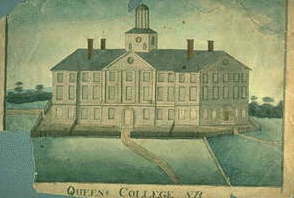 Classes were held through the American Revolution in various taverns and boarding houses, and at a building known as College Hall on George Street, until Old Queens was erected in 1808. It remains the oldest building on the Rutgers University campus. The Queen's College Grammar School (now Rutgers Preparatory School) was established also in 1766, and shared facilities with the College until 1830, when it located in a building (now known as Alexander Johnston Hall) across College Avenue from Old Queens. After Rutgers University became the state university of New Jersey in 1956, the Trustees of Rutgers divested it of the Rutgers Preparatory School, which relocated in 1957 to an estate purchased from the Colgate-Palmolive Company in Franklin Township in neighboring Somerset County. The New Brunswick Theological Seminary, founded in 1784, moved to New Brunswick in 1810, sharing its quarters with the fledgling Queen's College (Queens would close from 1810 to 1825 due to financial problems, and reopen in 1825 under the name Rutgers College). The Seminary, due to overcrowding and differences over the mission of Rutgers College as a secular institution, moved to a seven acre (28,000 m2) tract of land less than one-half mile (800 m) west, which it still occupies, although the land is now in the middle of Rutgers University's College Avenue campus. The Committee of Hungarian Churches and Organizations of New Brunswick commemorating the anniversary of the Hungarian Revolution of 1956. New Brunswick began attracting a Hungarian immigrant population around the turn of the 20th century. Hungarians were primarily attracted to the city by employment at Johnson & Johnson factories located in the city. Hungarians settled mainly in what today is the fifth ward. The immigrant population grew until the end of the early century immigration boom. During the Cold War, the community was revitalized by the decision to house refugees from the failed 1956 Hungarian Revolution at Camp Kilmer, in nearby Edison. Even though the Hungarian population has been largely supplanted by newer immigrants, there continues to be a Hungarian Festival in the city held on Somerset Street on the first Saturday of June each year. Many Hungarian institutions set up by the community remain and active in the neighborhood, including: Magyar Reformed Church, Ascension Lutheran Church (Elso Magyar Evangélikus Egyhaz) St. Ladislaus Roman Catholic Church, St. Joseph Byzantine Catholic Church, Hungarian American Athletic Club, Aprokfalva Montessori Preschool (Aprokfalva Mindennapos Magyar Óvoda),Széchenyi Hungarian Community School & Kindergarten (Széchenyi Magyar Iskola és Óvoda), Teleki Pál Scout Home, Hungarian American Foundation, Vers Hangja, Hungarian Poetry Group, Bolyai Lecture Series on Arts and Sciences (Bolyai Kör),Hungarian Alumni Association (Magyar Öregdiák Szövetség - Bessenyei György Kör), Hungarian Radio Program, Hungarian Civic Association, Committee of Hungarian Churches and Organizations of New Brunswick, Csűrdöngölő Folk Dance Ensemble. Several landmarks in the city also testify to its Hungarian heritage. There is a street and a recreation park named after Lajos Kossuth, the famous leader of the Hungarian Revolution of 1848. The corner of Somerset Street and Plum Street is named Mindszenty Square where the first ever statue of Cardinal Joseph Mindszenty was erected. A stone memorial to the victims of the 1956 Hungarian Revolution also stands nearby. Since the 1960s, many of the new residents of New Brunswick have come from Latin America. Many citizens moved from Puerto Rico in the 1970s. In the 1980s, many immigrated from the Dominican Republic, and still later especially from Guatemala, Honduras, Ecuador and Mexico. There are many Latino businesses on and around French Street (NJ Rt. 27). New Brunswick contains a number of examples of urban renewal in the United States. In the 1960s-1970s, the downtown area became blighted as middle class residents moved to newer suburbs surrounding the city, an example of the phenomenon known as "white flight". Beginning in 1975, Rutgers University, Johnson & Johnson, and the local government collaborated through the New Jersey Economic Development Authority to form the New Brunswick Development Company (DevCo), with the goal of revitalizing the city center and redeveloping neighborhoods considered to be blighted and dangerous (via demolition of existing buildings and construction of new ones) Johnson & Johnson decided to remain in New Brunswick and built a new World Headquarters building in the area between Albany Street, Amtrak's Northeast Corridor, Route 18, and George Street, requiring many old buildings and historic roads to be removed. The Hiram Market area, a historic district which by the 1970s had become a mostly Puerto Rican and Dominican-American neighborhood, was demolished to build a Hyatt hotel and conference center, and upscale housing. Johnson & Johnson guaranteed Hyatt Hotels' investment as they were wary of building an upscale hotel in a run-down area. The redevelopment process has been controversial. Devco, the hospitals, and the city government continue to draw ire from both historic preservationists, those opposing gentrification, and those concerned with eminent domain abuses, and tax abatements for developers. The Gateway tower, a 22 story redevelopment project next to the train station, was completed in 2012. New Brunswick is located at 40°29′12″N 74°26′40″W﻿ / ﻿40.486678, -74.444414 (40.486678,-74.444414). According to the United States Census Bureau, the city had a total area of 5.789 square miles (14.995 km2), of which, 5.227 square miles (13.539 km2) of it is land and 0.562 square miles (1.456 km2) of it (9.71%) is water. New Brunswick is in Raritan Valley (a line of cities in central New Jersey). New Brunswick is on the south side of Raritan Valley along with Piscataway, Highland Park, Edison and Franklin Township (Somerset County). New Brunswick is approximately 40 minutes southwest of New York City and 45 minutes northeast of Philadelphia. New Brunswick is bordered by Piscataway, Highland Park, and Edison across the Raritan River to the north, and also by North Brunswick to the southwest, East Brunswick to the southeast, and Franklin Township in Somerset County. New Brunswick has a humid subtropical climate (Köppen climate classification Cfa) typical to New Jersey, characterized by humid, warm summers and cold winters with moderate to considerable rainfall throughout the year. As of the 2010 United States Census, there were 55,181 people, 14,119 households, and 7,751 families residing in the city. The population density was 10,556.4 inhabitants per square mile (4,075.8 /km2). There were 15,053 housing units at an average density of 2,879.7 per square mile (1,111.9 /km2). The racial makeup of the city was 45.43% (25,071) White, 16.04% (8,852) African American, 0.90% (498) Native American, 7.60% (4,195) Asian, 0.03% (19) Pacific Islander, 25.59% (14,122) from other races, and 4.39% (2,424) from two or more races. Hispanic or Latino of any race were 49.93% (27,553) of the population. There were 14,119 households out of which 31.0% had children under the age of 18 living with them, 29.2% were married couples living together, 17.5% had a female householder with no husband present, and 45.1% were non-families. 25.8% of all households were made up of individuals and 7.2% had someone living alone who was 65 years of age or older. The average household size was 3.36 and the average family size was 3.91. In the city the population was spread out with 21.1% under the age of 18, 33.2% from 18 to 24, 28.4% from 25 to 44, 12.2% from 45 to 64, and 5.2% who were 65 years of age or older. The median age was 23.3 years. For every 100 females there were 105.0 males. For every 100 females age 18 and over, there were 105.3 males. The Census Bureau's 2006-2010 American Community Survey showed that (in 2010 inflation-adjusted dollars) median household income was $44,543 (with a margin of error of +/- $2,356) and the median family income was $44,455 (+/- $3,526). Males had a median income of $31,313 (+/- $1,265) versus $28,858 (+/- $1,771) for females. The per capita income for the borough was $16,395 (+/- $979). About 15.5% of families and 25.8% of the population were below the poverty line, including 25.4% of those under age 18 and 16.9% of those age 65 or over. As of the 2000 United States Census, there were 48,573 people, 13,057 households, and 7,207 families residing in the city. The population density was 9,293.5 per square mile (3,585.9/km2). There were 13,893 housing units at an average density of 2,658.1 per square mile (1,025.6/km2). The racial makeup of the city was 48.79% White, 23.03% African American, 0.46% Native American, 5.32% Asian, 0.08% Pacific Islander, 18.08% from other races, and 4.24% from two or more races. 39.01% of the population were Hispanic or Latino of any race. There were 13,057 households of which 29.1% had children under the age of 18 living with them, 29.6% were married couples living together, 18.0% had a female householder with no husband present, and 44.8% were non-families. 24.3% of all households were made up of individuals and 8.4% had someone living alone who was 65 years of age or older. The average household size was 3.23 and the average family size was 3.69. 20.1% of the population were under the age of 18, 34.0% from 18 to 24, 28.1% from 25 to 44, 11.3% from 45 to 64, and 6.5% who were 65 years of age or older. The median age was 24 years. For every 100 females there were 98.4 males. For every 100 females age 18 and over, there were 96.8 males. The median household income in the city was $36,080, and the median income for a family was $38,222. Males had a median income of $25,657 versus $23,604 for females. The per capita income for the city was $14,308. 27.0% of the population and 16.9% of families were below the poverty line. Out of the total people living in poverty, 25.9% were under the age of 18 and 13.8% were 65 or older. The City of New Brunswick is governed under the Faulkner Act (Mayor-Council) system of municipal government. As the legislative body of New Brunswick's municipal government, the City Council is responsible for approving the annual budget, ordinances and resolutions, contracts, and appointments to boards and commissions. The City Council has five members elected at large to staggered four-year terms. The Council President, elected to a 2-year term by the Council, presides over all meetings. As of 2012, James Cahill is the 62nd Mayor of New Brunswick; He was sworn in as Mayor on January 1, 1991. Members of the City Council are Council President Robert Recine, Council Vice President Rebecca Escobar, Jimmie L. Cook, Jr., Kevin Egan and Elizabeth Sheehan Garlatti. The New Brunswick police department has received attention for various incidents over the years. In 1991, the fatal shooting of Shaun Potts, an unarmed black resident, by Sergeant Zane Grey led to multiple local protests. In 1996, Officer James Consalvo fatally shot Carolyn "Sissy" Adams, an unarmed prostitute who had bit him. The Adams case sparked calls for reform in the New Brunswick police department, and ultimately was settled with the family. In 2011, Officer Brad Berdel fatally shot Barry Deloatch, a black man who had run from police (although police claim he struck officers with a stick); this sparked daily protests from residents. Following the Deloatch shooting, sergeant Richard Rowe was formally charged with mishandling 81 Internal Affairs investigations; Mayor Cahill explained that this would help "rebuild the public's trust and confidence in local law enforcement." New Brunswick is located in the 6th Congressional District and is part of New Jersey's 17th state legislative district. 17th Legislative District of the New Jersey Legislature, which is represented in the New Jersey Senate by Bob Smith (D, Piscataway) and in the New Jersey General Assembly by Upendra J. Chivukula (D, Somerset) and Joseph V. Egan (D, New Brunswick). The Governor of New Jersey is Chris Christie (R, Mendham). The Lieutenant Governor of New Jersey is Kim Guadagno (R, Monmouth Beach). As of March 23, 2011, there were a total of 22,742 registered voters in New Brunswick Township, of which 8,732 (38.4%) were registered as Democrats, 882 (3.9%) were registered as Republicans and 13,103 (57.6%) were registered as Unaffiliated. There were 25 voters registered to other parties. In the 2008 presidential election, Democrat Barack Obama received 83.3% of the vote here (10,717 cast), ahead of Republican John McCain with 14.8% (1,899 votes) and other candidates with 1.1% (140 votes), among the 12,873 ballots cast by the township's 23,533 registered voters, for a turnout of 54.7%. In the 2004 presidential election, Democrat John Kerry received 78.2% of the vote here (8,023 ballots cast), outpolling Republican George W. Bush with 19.7% (2,018 votes) and other candidates with 0.7% (143 votes), among the 10,263 ballots cast by the township's 20,734 registered voters, for a turnout percentage of 49.5. In the 2009 gubernatorial election, Democrat Jon Corzine received 68.2% of the vote here (4,281 ballots cast), ahead of Republican Chris Christie with 20.9% (1,314 votes), Independent Chris Daggett with 6.2% (387 votes) and other candidates with 2.0% (128 votes), among the 6,273 ballots cast by the township's 22,534 registered voters, yielding a 27.8% turnout. The New Brunswick Public Schools serve students in kindergarten to twelfth grade. The district is one of 31 Abbott districts statewide, which are now referred to as "SDA Districts" based on the requirement for the state to cover all costs for school building and renovation projects in these districts under the supervision of the New Jersey Schools Development Authority. New Brunswick's Board of Education members are appointed by the city's mayor. Schools in the district (with 2010-11 enrollment data from the National Center for Education Statistics) are Lincoln Elementary School (grades PreK-8; 526 students), Livingston Elementary School (K-8; 438), McKinley Community Elementary School (PreK-5; 769), A. Chester Redshaw Elementary School (PreK-8; 709), Paul Robeson Community Elementary School / Paul Robeson Annex (PreK-5; 509), Roosevelt Elementary School (PreK-5; 803), Lord Stirling Elementary School (PreK-5; 606), Woodrow Wilson Elementary School (PreK-8; 405), New Brunswick Middle School (6-8; 1,147), New Brunswick High School (9-12; 1,509) and Health Sciences Technology High School. The community is also served by the Greater Brunswick Charter School, a K-8 charter school with an enrollment of about 250 children from New Brunswick, Highland Park, Edison and other area communities. Rutgers University has three campuses in the city: College Avenue Campus (seat of the University), Douglass Campus, and Cook Campus, which limits extend into outer townships. Rutgers has also added several buildings downtown in the last two decades, both academic and residential. New Brunswick is the site to the New Brunswick Theological Seminary, a seminary of the Reformed Church in America, founded in 1784. Robert Wood Johnson Medical School, part of the University of Medicine and Dentistry of New Jersey, is located in New Brunswick and Piscataway. Middlesex County College has some facilities downtown, though its main campus is in Edison. Most of New Brunswick's retail businesses are within a designated Urban Enterprise Zone. In addition to other benefits to encourage employment within the zone, shoppers can take advantage of a reduced 3½% sales tax rate (versus the 7% rate charged statewide) at eligible merchants. City Hall has promoted the nickname "The Health Care City" to reflect the importance of the healthcare industry to its economy. The city is home to the world headquarters of Johnson & Johnson, along with several medical teaching and research institutions including Saint Peter's University Hospital, Robert Wood Johnson University Hospital and the Robert Wood Johnson Medical School, the Cancer Institute of New Jersey, and The Bristol-Myers Squibb Children's Hospital. Southbound platform of New Brunswick's NJ Transit train station. University Center at Easton Ave is in the background. Panorama of New Brunswick Train Station track to New York City. New Brunswick is served by New Jersey Transit and Amtrak trains on the Northeast Corridor Line. New Jersey Transit provides frequent service north to Pennsylvania Station, in Midtown Manhattan, and south to Trenton, while Amtrak's Keystone Service and Northeast Regional trains service the station. The Jersey Avenue station is also served by Northeast Corridor trains. For other Amtrak connections, riders can take New Jersey Transit to Pennsylvania Station, Trenton, Metropark, or Newark Penn Station. Local bus service is provided by NJ Transit's 810, 811, 814, 815, 818 routes and 980 route, the extensive Rutgers Campus bus network, the MCAT shuttle system, DASH buses, Brunsquick shuttles and NYC bound Suburban Trails buses. Studies are being conducted to create the New Brunswick Bus Rapid Transit system. New Brunswick was at the eastern terminus of the Delaware and Raritan Canal, of which there are remnants surviving or rebuilt along the river. Until 1936, the city was served by the interurban Newark–Trenton Fast Line. The New Brunswick Parking Authority (NBPA) manages New Brunswick NJ Parking facilities alongside CitiPark CitiPark who manages a downtown parking facility at 2 Albany Street. The city encompasses the intersection of U.S. Route 1 and Route 18, and is bisected by Route 27. New Brunswick hosts less than a mile of the New Jersey Turnpike (I-95). A few turnpike ramps are in the city that lead to Exit 9 which is just outside the city limits in East Brunswick Township. Other major roads that are nearby include the Garden State Parkway in Woodbridge Township and I-287 in neighboring Edison, Piscataway and Franklin townships. Three neighboring professional venues, Crossroads Theatre designed by Parsons+Fernandez-Casteleiro Architects from New York. In 1999, the Crossroads Theatre won the prestigious Tony Award for Outstanding Regional Theatre. Crossroads is the first African American theater to receive this honor in the 33-year history of this special award category. There is also George Street Playhouse, and the State Theater, comprise the heart of the local theatre scene. The State Theatre is also home to the American Repertory Ballet and the Princeton Ballet School.. Rutgers University has a number of student companies that perform everything from cabaret acts to Shakespeare and musical productions. New Brunswick is the site of the Jane Voorhees Zimmerli Art Museum at Rutgers University, Albus Cavus, and the Rutgers University Geology Museum. New Brunswick was an important centre for avant-garde art in the 1950s-70s with several artists such as Allan Kaprow, George Segal, George Brecht, Robert Whitman, Robert Watts, Lucas Samaras, Geoffrey Hendricks and Roy Lichtenstein; some of whom had taught at Rutgers University. This group of artists was sometimes referred to as the 'New Jersey School' or the 'New Brunswick School of Painting'. For more information, see Fluxus at Rutgers University. New Brunswick has a diverse restaurant market including Nouvelle American, Italian, Middle Eastern, Mexican, Peruvian, Indian, Ethiopian, Thai and Chinese cuisine. Restaurants such as Frog and the Peach, Delta's, Panico's, The Old Bay, Clydz, Tumulty's Pub, Makeda's, Stage Left and Old Man Rafferty's, serve the downtown area. The "Grease Trucks" at Rutgers University's College Avenue campus. The "Grease Trucks" are a group of truck-based food vendors located on the College Avenue campus of Rutgers University. They are known for serving "Fat Sandwiches", a sub roll containing several ingredients such as steak, chicken fingers, French fries, falafel, cheeseburgers, mozzarella sticks, gyro meat, bacon, eggs and / or marinara sauce. New Brunswick's bar scene has been the home to many original rock bands, including some which went on to national prominence such as The Smithereens and Bon Jovi, as well as a center for local punk rock and underground music. Many alternative rock bands got radio airplay thanks to Matt Pinfield who was part of the New Brunswick music scene for over 20 years at Rutgers University radio station WRSU. Local pubs and clubs hosted many local bands, including the Court Tavern until 2012 (scheduled to reopen), and the Melody Bar during the 1980s and 1990s. New Brunswick is referenced in the movie The Adventures of Buckaroo Banzai Across the 8th Dimension directed by W. D. Richter. On April 18, 1872, at New Brunswick, William Cameron Coup developed the system of loading circus equipment and animals on railroad cars from one end and through the train, rather than from the sides. This system would be adopted by other railroad circuses and used through the golden age of railroad circuses and even by the Ringling shows today. New Brunswick is the home of the fictional character Emily Pollifax from Dorothy Gilman's Mrs. Pollifax series. The 1980s sitcom, Charles in Charge, was set in New Brunswick. The 2004 movie Harold and Kumar Go To White Castle revolves around Harold and Kumar's attempt to get to a White Castle restaurant that ultimately winds up being in New Brunswick. David Abeel (1804–1846), Dutch Reformed Church missionary. Garnett Adrain (1815–1878), member of the United States House of Representatives. Jim Axelrod, national correspondent for CBS News, and reports for the CBS Evening News. James Berardinelli (born 1967), film critic, born in NB. in the United States House of Representatives from 1855-1857. Gary Brokaw (born 1954), former NBA basketball player. Jonathan Casillas (born 1987), linebacker for the NFL's New Orleans Saints and University of Wisconsin. Wheeler Winston Dixon (born 1950), filmmaker, critic, and author. Eduardo "EJ" Duran (born 1986), music video and film director. Michael Douglas (born 1944), actor. Anthony Walton White Evans (1817–1886), engineer. Louis Michael Figueroa (born 1966), arguably the most prolific transcontinental journeyman. All involved in the Hall-Mills Murder case of the 1920s. Augustus A. Hardenbergh (1830–89), represented New Jersey's 7th congressional district from 1875 to 1879, and again from 1881 to 1883. Mel Harris, (born 1956), actress. Mark Helias (born 1950), jazz bassist/composer. Adam Hyler (1735–1782), privateer during the American Revolutionary War. Jaheim (Hoagland) (born 1978), R&B singer. Dwayne Jarrett (born 1986), wide receiver for the University of Southern California football team 2004 to 2006, current WR drafted by the Carolina Panthers. James P. Johnson (1891–1955), pianist, composer. One of the original stride piano masters. Robert Wood Johnson I (1845–1910), businessman. Robert Wood Johnson II (1893–1968), businessman who led Johnson & Johnson and served as mayor of Highland Park, New Jersey. William H. Johnson (1829–1904), painter and wallpaper hanger, businessman and local crafts person, whose home (c. 1870) was placed on the State of New Jersey and National Registers of Historic Places in 2006.
in the United States House of Representatives from 1853 to 1855, and was mayor of New Brunswick in 1841 and 1842. Ted Kubiak (born 1942), MLB player for the Kansas City/Oakland Athletics, Milwaukee Brewers, St. Louis Cardinals, Texas Rangers, and the San Diego Padres. Jim Norton (born 1968), comedian. Robert Pastorelli (1954–2004), actor known primarily for playing the role of the house painter on Murphy Brown. Miles Ross (1827–1903), Mayor of New Brunswick, U.S. Representative and businessman. Gabe Saporta (born 1979), musician and frontman of bands Midtown and Cobra Starship. George Sebastian Silzer (1870–1940) served as the 38th Governor of New Jersey. Served on the New Brunswick board of aldermen from 1892 to 1896. James H. Simpson (1813–1883), U.S. Army surveyor of western frontier areas. Larry Stark (born 1932), theater reviewer and creator of Theater Mirror. Ron "Bumblefoot" Thal (born 1969), guitarist, musician, composer. Joe Theismann (born 1949), former NFL quarterback and former commentator on ESPN's Monday Night Football. William Henry Vanderbilt (1821–85), businessman. in the United States House of Representatives from 1847 to 1851, and served as Mayor of New Brunswick from 1846 to 1847. Paul Wesley (born 1982), actor, known for his role as "Stefan Salvatore" on The CW show The Vampire Diaries. Eric Young (born 1967), former Major League Baseball player. Corner of Somerset Street and Easton Avenue, looking southeast. Buildings on the left have since been demolished. ^ a b 2005 New Jersey Legislative District Data Book, Rutgers University Edward J. Bloustein School of Planning and Public Policy, April 2005, p. 81. ^ 2011 New Jersey Mayors Directory, New Jersey Department of Community Affairs, dated February 13, 2012. Accessed April 18, 2012. ^ Department ofAdministration, city of New Brunswick. Accessed April 18, 2012. ^ a b c d e Gazetteer of New Jersey Places, United States Census Bureau. Accessed October 18, 2012. ^ USGS GNIS: City of New Brunswick , Geographic Names Information System, accessed April 15, 2007. ^ a b c d e f DP-1 - Profile of General Population and Housing Characteristics: 2010 for New Brunswick city, Middlesex County, New Jersey, United States Census Bureau. Accessed April 18, 2012. ^ a b c Table DP-1. Profile of General Demographic Characteristics: 2010 for New Brunswick city, New Jersey Department of Labor and Workforce Development. Accessed April 18, 2012. ^ Look Up a ZIP Code for New Brunswick, NJ, United States Postal Service,. Accessed April 18, 2012. ^ A Cure for the Common Codes: New Jersey, Missouri Census Data Center. Accessed May 19, 2012. ^ Middlesex County, NJ, National Association of Counties. Accessed January 21, 2013. ^ Table 7. Population for the Counties and Municipalities in New Jersey: 1990, 2000 and 2010, New Jersey Department of Labor and Workforce Development, February 2011. Accessed November 23, 2012. ^ "7:30 a.m. -- Filling cracks in the HealthCare City", Home News Tribune, September 23, 1999. "With two major hospitals and a medical school, New Brunswick proclaims itself The Healthcare City." ^ "A wet day in the Hub City", Home News Tribune, September 23, 1999. "A few days short of 60 years, on Wednesday, Sept. 16, a dreary, drizzly day just ahead of the deluge of Hurricane Floyd, the Home News Tribune sent 24 reporters, 9 photographers and one artist into the Hub City, as it is known, to take a peek into life in New Brunswick as it is in 1999." ^ Snyder, John P. The Story of New Jersey's Civil Boundaries: 1606-1968, Bureau of Geology and Topography; Trenton, New Jersey; 1969. p. 171. Accessed March 26, 2012. ^ Weiss, Jennifer. "REDEVELOPMENT; As New Brunswick Grows, City's Hungarians Adapt", The New York Times, July 16, 2006. Accessed April 18, 2012. "While the Hungarian community has diminished over the years -- in the 1930s it made up a third of New Brunswick's population -- much of what it built remains." ^ Staff. "NEW-JERSEY. ; Miscellaneous Notes about New-Brunswick. ", The New York Times, July 27, 1854. Accessed April 18, 2012. "If the 'desperately hot' weather permit, I purpose to give you a few items of general interest respecting this ancient Dutch settlement. However, with the mercury ranging from 78° to 98° in the shade, during the sixteen hours of sunshine, you will not expect much exertion on my part. DANIEL COOPER (says GORDON,) was the first recorded inhabitant of 'Prigmore's Swamp.'" ^ Devco spends $1.6 billion since 1970s, The Daily Targum, January 25, 2006. ^ Raids by Housing Inspectors Anger Jersey Neighborhood , The New York Times, March 12, 1988. ^ Students protest DevCo redevelopment, The Daily Targum, September 15, 1999. ^ Tenants' place is uncertain, The Daily Targum, November 9, 1999. ^ Česky. "Köppen climate classification - Wikipedia, the free encyclopedia". En.wikipedia.org. http://en.wikipedia.org/wiki/K%C3%B6ppen_climate_classification. Retrieved 2012-05-08. ^ "NowData - NOAA Online Weather Data". National Oceanic and Atmospheric Administration. http://www.nws.noaa.gov/climate/xmacis.php?wfo=phi. Retrieved 2011-12-20. ^ Census Estimates for New Jersey April 1, 2010 to July 1, 2011, United States Census Bureau. Accessed September 21, 2012. ^ Lundy, F. L., et. al. Manual of the Legislature of New Jersey, Volume 116, p. 417. J.A. Fitzgerald, 1892. Accessed November 25, 2012. ^ Thirteenth Census of the United States, 1910: Population by Counties and Minor Civil Divisions, 1910, 1900, 1890, United States Census Bureau, p. 337. Accessed May 19, 2012. ^ Fifteenth Census of the United States : 1930 - Population Volume I, United States Census Bureau, p. 711. Accessed May 19, 2012. ^ New Jersey Resident Population by Municipality: 1930 - 1990, Workforce New Jersey Public Information Network, backed up by the Internet Archive as of May 2, 2009. Accessed May 19, 2012. ^ a b c d e Census 2000 Profiles of Demographic / Social / Economic / Housing Characteristics for New Brunswick city, New Jersey, United States Census Bureau. Accessed November 23, 2012. ^ a b c d e DP-1: Profile of General Demographic Characteristics: 2000 - Census 2000 Summary File 1 (SF 1) 100-Percent Data for New Brunswick city, Middlesex County, New Jersey, United States Census Bureau. Accessed November 23, 2012. ^ DP03: Selected Economic Characteristics from the 2006-2010 American Community Survey 5-Year Estimates for New Brunswick city, Middlesex County, New Jersey, United States Census Bureau. Accessed May 19, 2012. ^ Mayor's Bio, City of New Brunswick. Accessed May 19, 2012. ^ City council, City of New Brunswick. Accessed May 19, 2012. ^ via Associated press. "Police Slaying of a Black Man Brings Protest", The New York Times, July 2, 1991. Accessed May 19, 2012. ^ Sapone, Patti (October 2011). "In uproar over alleged police brutality, New Brunswick residents call for mayor's resignation". The Star-Ledger (NJ.com). http://www.nj.com/news/index.ssf/2011/10/in_uproar_over_alleged_police.html. Retrieved 12 November 2011. ^ "Legislative Roster: 2010-2011 Session". New Jersey Legislature. http://www.njleg.state.nj.us/members/roster.asp. Retrieved 2010-07-01. ^ Abbott Districts, New Jersey Department of Education, backed up by the Internet Archive as of May 15, 2009. Accessed August 15, 2012. ^ What are SDA Districts?, New Jersey Schools Development Authority. Accessed August 15, 2012. "SDA Districts are 31 special-needs school districts throughout New Jersey. They were formerly known as Abbott Districts, based on the Abbott v. Burke case in which the New Jersey Supreme Court ruled that the State must provide 100 percent funding for all school renovation and construction projects in special-needs school districts.... The districts were renamed after the elimination of the Abbott designation through passage of the state's new School Funding Formula in January 2008." ^ SDA Districts, New Jersey Schools Development Authority. Accessed August 15, 2012. ^ Data for the New Brunswick Public Schools, National Center for Education Statistics. Accessed November 25, 2012. ^ Greater Brunswick Charter School, Greater Brunswick Charter School. Accessed June 25, 2008. ^ Geographic & Urban Redevelopment Tax Credit Programs: Urban Enterprise Zone Employee Tax Credit, State of New Jersey, backed up by the Internet Archive as of January 3, 2010. Accessed October 26, 2010. ^ Dore Carroll, New Brunswick: Medical field at hub of this transformation, The Star-Ledger, August 29, 2004. ^ Id. ; see also Health Care, City of New Brunswick website. ^ "Campus Buses". Rutgers University. http://rudots.rutgers.edu/campusbuses.shtml. Retrieved 2012-04-03. ^ "Middlesex County Area Transit (MCAT) Shuttle Routes". Middlesex County. 2012. http://www.co.middlesex.nj.us/awts/communityshuttle.asp. Retrieved 2012-04-01. ^ "Dash 1 and Dash 2". Ridewise. http://www.ridewise.org/display.php?sc=PT&adid=336. Retrieved 2012-05-05. ^ "History". Crossroads Theatre Company. Crossroads Theatre Company. http://www.crossroadstheatrecompany.org/about/history. Retrieved 12 November 2011. ^ Rutgers University Geological Sciences, Rutgers University. ^ Shabe, John. "Who needs Internet pizza when Rutgers has The Grease Trucks? ", The Star-Ledger, December 29, 2008. Accessed October 26, 2011. ^ Jovanovic, Rob (2004). Perfect Sound Forever: The Story of Pavement. Justin, Charles & Co. ISBN 1-932112-07-3. ^ "New Brunswick business owner plans to reopen the court tavern - The Daily Targum: Metro". The Daily Targum. 2012-04-17. http://www.dailytargum.com/news/metro/new-brunswick-business-owner-plans-to-reopen-the-court-tavern/article_71e4e334-883f-11e1-bffb-001a4bcf6878.html. Retrieved 2012-05-08. ^ Charles Be DeMille, Charles in Charge, Season 5, Prod. Michael Jacobs, Dir. Scott Baio, Writers, Jennifer Burton, David Lang, Perf. Scott Baio, Syndication, December 22, 1990. At about 7'35" into the episode, Charles says in a telephone conversation that someone will come "here to New Brunswick" to visit him. ^ "Harold and Kumar Go To White Castle". The Internet Movie Script Database. http://www.imsdb.com/scripts/Harold-and-Kumar-Go-to-White-Castle.html. Retrieved 2011-11-21. ^ Jim Axelrod: CBS Chief White House Correspondent, CBS News. Accessed August 12, 2007. ^ James Berardinelli profile, Rotten Tomatoes, accessed March 17, 2007. "I was born in September 1967 in the town of New Brunswick, New Jersey (USA)." ^ Gary Brokaw, Basketball-Reference.com. Accessed September 17, 2007. ^ Fly, Colin. "Once special teams whiz, Casillas now face of No. 7 Badgers LBs", USA Today, September 13, 2007. Accessed February 26, 2011. "But it starts with Casillas, the self-proclaimed family man from New Brunswick, N.J., who was the Badgers' leading returning tackler from last season and is often called into pass coverage." ^ Foster, Gwendolyn Audrey "Community, Loss, and Regeneration: An Interview with Wheeler Winston Dixon", Senses of Cinema. Accessed August 2, 2007. ^ 'Acting 'Runs In The Family', CBS News, April 15, 2003. "Born Michael Kirk Douglas in New Brunswick, N.J., Sept. 25, 1944"
^ A. Walton White Evans Family Papers, 1709-1891, Rensselaer Polytechnic Institute, accessed April 23, 2007. "Anthony Walton White Evans was born in New Brunswick, NJ October 31, 1817, the son of Thomas M. Evans and Eliza M. White." ^ Howard, Cory. The Man Who Inspired The Words Of Forrest Gump Walks Across The Country...Again", KHQ-TV, September 11, 2010. Accessed November 15, 2012. "To give Bobby hope, Louis promised he would run across America for him. In 1982, the teenager set out from New Brunswick, New Jersey for San Francisco, raising money and awareness along the way for the American Cancer Society. Sixty days later, he became the fastest and youngest runner to run across America." ^ Augustus Albert Hardenbergh, Biographical Directory of the United States Congress. Accessed August 13, 2007. ^ The Ultimate New Jersey High School Year Book. ^ Raritan River Environmental Festival 2006 Musical Performances, accessed April 23, 2007. "Composer and bassist Mark Helias was born and raised in New Brunswick." ^ "Lossing's Field Book of the Revolution, Vol. II., Supplement I. ", accessed April 23, 2007. "On the arrival of the British the following summer, Captains Adam Hyler and Wm. Marriner, of New Brunswick, New Jersey, annoyed them so much, that an armed force was sent to destroy their boats." ^ "Jaheim returns with new CD, 'Ghetto Classics' and talks about his musical heroes", Jet (magazine), April 10, 2006, accessed April 23, 2007. "Born Jaheim Hoagland in the housing projects of New Brunswick, NJ, he was inspired to sing by his grandfather." ^ USC star WR Jarrett to enter NFL draft, NFL, press release dated January 10, 2007, accessed April 29, 2007. "Jarrett, a 6-foot-5, 215-pounder from New Brunswick, N.J., ends his college career with 216 catches for 3,138 yards and a Pac-10-record 41 touchdowns in 38 games." ^ IJS Receives Archives of Composer/Pianist James P. Johnson, press release date July 29, 2004, accessed April 23, 2007. Renowned worldwide as the "Father of Stride Piano," Johnson was born in New Brunswick in 1894." ^ Staff. "Robert Wood 'Johnson, 74, Dies; Chairman of Johnson & Johnson; Founder's Son Led Company Until 1963 - No. 2 Man on War Production Board", The New York Times, January 31, 1968. Accessed October 26, 2011. "On April 4, 1893, Mr. Johnson was born in New Brunswick, N.J., where Johnson & Johnson maintained its headquarters." ^ New Brunswick Historic Sites: Joyce Kilmer House, accessed December 7, 2006. ^ Littleton Kirkpatrick, Biographical Directory of the United States Congress. Accessed September 1, 2007. ^ Ted Kubiak , Baseball-Reference. Accessed June 18, 2009. ^ Cronick, Scott. "COMEDIAN JIM NORTON INSENSITIVE, VULGAR", The Press of Atlantic City, July 30, 2002. Accessed October 26, 2011. "The 33-year-old New Brunswick native sold out two shows at the Shell at Trump Marina Hotel Casino on Saturday night, leaving other fans outside looking for tickets. The only question is: Who is Jim Norton?" ^ 'Murphy Brown' Housepainter Dies: Actor Robert Pastorelli Dead At 49, May Have Been Drug Overdose, CBS News, March 9, 2004. ^ Stravelli, Gloria. "The right song at the right time in the right movie: Doors of Hollywood swung open for musician after 1987 Academy Award", Atlanticville, April 11, 2002. Accessed May 12, 2008. "'There was always music at home,' Previte recalled about his boyhood in New Brunswick." ^ Miles Ross, Biographical Directory of the United States Congress. Accessed March 18, 2011. ^ New Jersey Governor George Sebastian Silzer, National Governors Association. Accessed August 5, 2007. ^ James H. Simpson, Cullum's Register, 679. Accessed March 18, 2011. ^ Schelly, Bill. "Larry Stark", Founders of Comic Fandom: Profiles of 90 Publishers, Dealers, Collectors, Writers, Artists and Other Luminaries of the 1950s and 1960s, p. 124. McFarland & Company, 2010. ISBN 0-7864-4347-2. Accessed June 29, 2011. "Larry Stark was born in New Brunswick, New Jersey, in August 1932." ^ PAUL WESLEY as STEFAN SALVATORE, The Vampire Diaries. Accessed March 18, 2011. "Born and raised in New Brunswick, New Jersey, Wesley currently resides in Atlanta, Georgia, where The Vampire Diaries films, and Los Angeles, California.". ^ "Young signs with Rangers", The Star-Ledger, August 12, 2006. "Young, out of Rutgers and New Brunswick, has played in 15 major- league seasons, including 2004 for the Rangers when they were in contention for the AL West title until the final week of the regular season." ^ Online Directory: New Jersey, USA, Sister Cities International. Accessed November 8, 2007. This page uses content from the English language Wikipedia. The original content was at New Brunswick, New Jersey. The list of authors can be seen in the page history. As with this Familypedia wiki, the content of Wikipedia is available under the Creative Commons License.